Those winds at Nido de Condor in the last dispatch were indeed significant. The team saw at least 7 tents belonging to other teams destroyed by winds while they were there! We stayed cozy and just fine however. A tribute to the BAI guides skill in setting up tents and the quality of BAI gear. Of Friday January 4 it was time to move to High Camp, the Berlin Camp at over 19,000 feet. There are some small wood A-framed shelters there and Sergio and Maria went to work digging the snow out of them so that they could provide good shelter for Maria’s kitchen. Kara and John slept outside the shelter in the same secure tent that had served them well at Nido. Breakfast call was early Saturday morning. Over many hours the team climbed steadily, but at 21, 700 feet, John told Osvi that the effort was good enough for this time. It is all about coming down! Congratulations to John and Kara! Aconcagua is the second highest of the “Seven Summits”. Of that group of continental high points, only Everest is higher. John extended his own mountain record to much greater elevations and for Kara, what a beginning, what a first mountain! 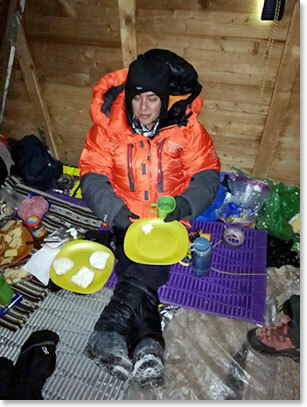 Kara the night before beginning the climb in the Berlin Camp A frame shelter, 19,200 feet. After months of travel in South America and days and days of high altitude climbing on Aconcagua Kara orders an Argentine steak. Looks like she is up for the task!